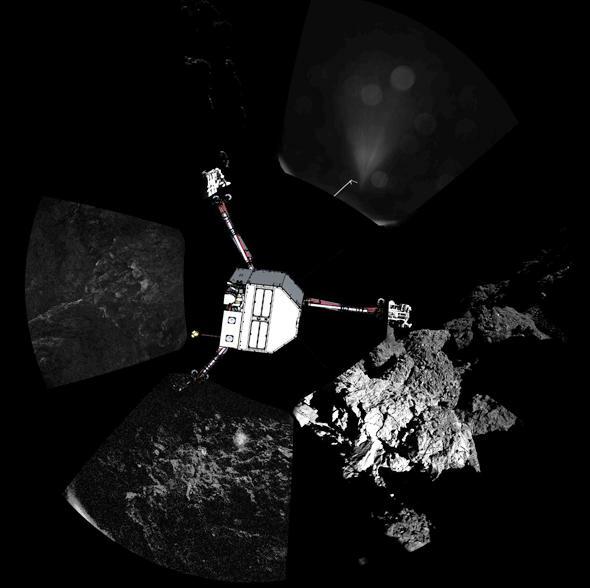 Comet update: Where is Philae? The first picture ever returned from the surface of a comet! 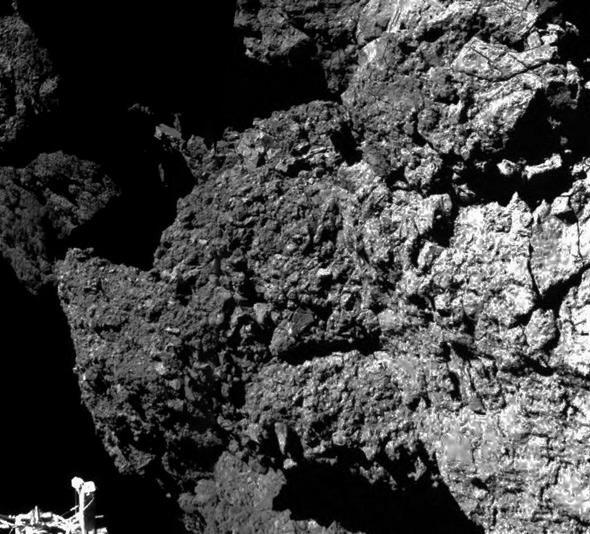 You can see the lander’s foot on the left, and the dark, rough texture of the comet. Yesterday, the Philae lander separated from the Rosetta spacecraft, descended to the comet 67P/Churyumov-Gerasimenko, and then … what, exactly? It was supposed to fire harpoons, reel itself down to the surface, then engage screws in the bottom of its landing legs to secure itself to the surface. However, the harpoons didn’t fire. Yesterday we knew it bounced, and landed somewhere else, but now we’ve learned more. 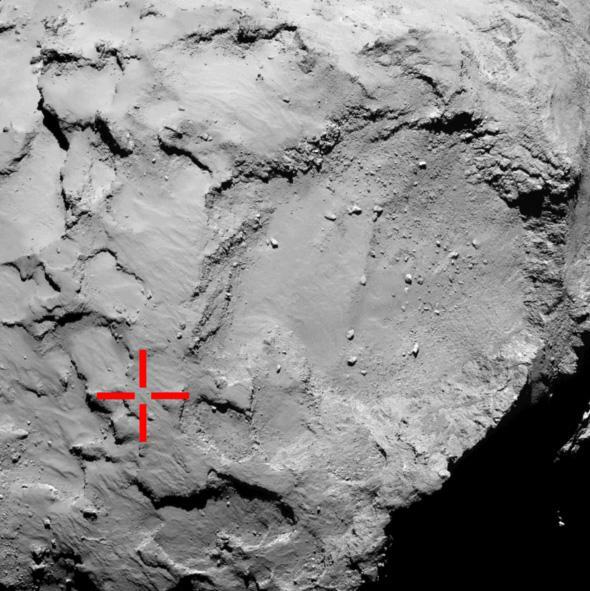 Image from Rosetta showing where Philae first hit (red cross). It then bounced and moved to the right, and now most likely sits inside the large, shallow crater. First of all, it actually bounced twice! It probably hit, then rebounded nearly a kilometer off the surface in the tremendously low gravity—on the comet it weighs about as much as 10 grams would on Earth, the same as four ping-pong balls. The comet rotated underneath it, and then the lander slowly hit again some distance downrange, only to rebound again. This was a much lower bounce, perhaps 20 meters (60 or so feet) high, and didn’t last nearly as long, only about seven minutes. 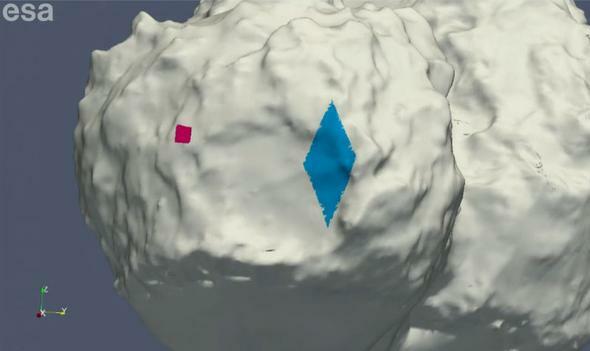 A map of the comet, showing where the lander originally hit (red square) and where it may have landed (blue diamond). Where did it land? It’s not clear. In the image above it hit in the red square, its original landing site, then bounced to somewhere in the blue diamond hundreds of meters away. There is a large, shallow crater on the top of the smaller of the two lobes of the comet (what looks like the rubber ducky’s head in the original pictures of the comet showing its shape) and it’s most likely in there somewhere. The high-resolution camera OSIRIS on Rosetta itself is busily taking images of the area to see if the lander can be spotted. The bad news is it isn’t upright. It’s on its side, with one leg sticking up “in the air”—really into space, since there’s no air on the comet. 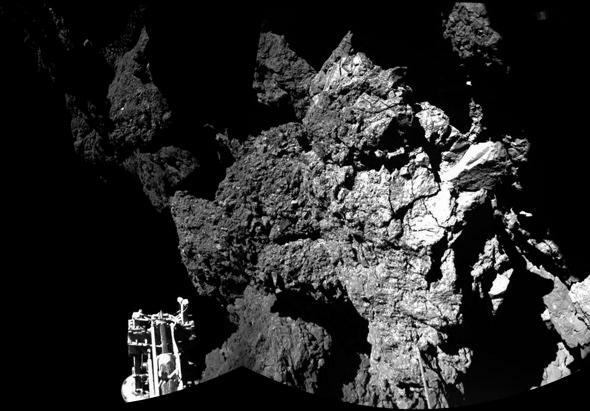 The good news is that the folks at the European Space Agency are still in contact with Philae, and it’s sending back data, including pictures. Detail from the first picture. And the first one sent back (at the top of this post, and enlarged above) is dramatic, showing the weird, forbidding landscape. The lander appears to have come to against a flattish surface of some kind. The angle is confusing, since we know the lander is on its side. The picture was taken by the CIVA camera near the top of the barrel-shaped lander, and it looks down on the foot. Judging from the orientation here, this means we may be seeing the highly angular surface of the comet, though it could be a wall or side of a cliff. The material looks more solid, not powdery and soft, which might explain the lander bouncing. A panorama made from several images from Philae, including a drawing of the lander superposed on it to show the orientation. Sideways is better than noways. The fan of light at the top is reflected sunlight inside the camera. The lighting is worrisome; if the lander is in shadow for long periods of time the frigid cold might affect it, and the solar panels may not be able to supply enough energy. Hopefully at the next ESA press conference they’ll be able to fill us in on that situation. So while this isn’t ideal, let’s keep in mind the real situation and what we’re seeing here: The Philae lander is down, on the surface of a comet, it’s working, sending back data, and will still be able to carry out much of its mission. That counts. This mission was already a success yesterday, and now everything we get back from it just makes things better.